1. Members shall at all times conduct their professional practices within the rules of Treasury Department Circular 230 and the Rules of Professional Conduct of this Association. 2. Members shall maintain a confidential relationship between themselves and their clients or former clients, disclosing confidential information only when authorized or legally obligated to do so. Members shall instruct employees that information acquired in their duties is confidential and shall ensure that confidentiality is maintained. 3. 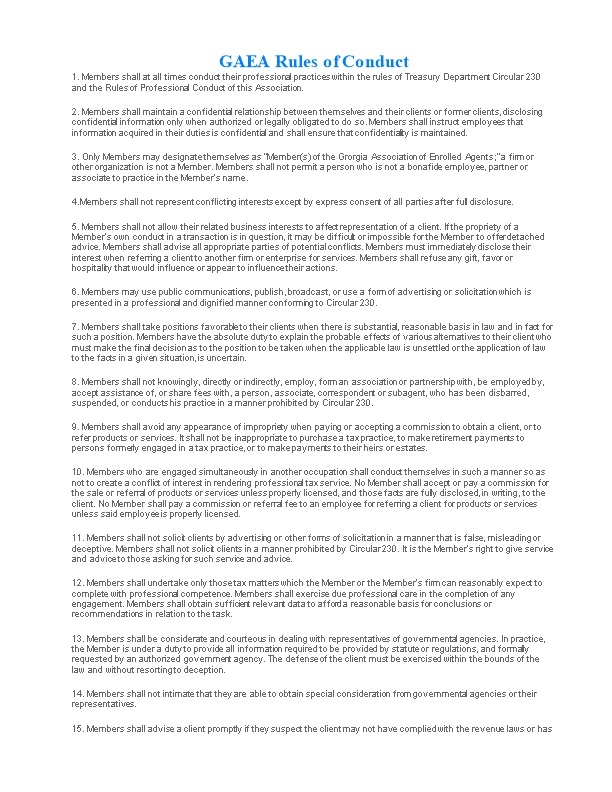 Only Members may designate themselves as "Member(s) of the Grorgia Association of Enrolled Agents;" a firm or other organization is not a Member. Members shall not permit a person who is not a bonafide employee, partner or associate to practice in the Member’s name. 4.Members shall not represent conflicting interests except by express consent of all parties after full disclosure. 5. Members shall not allow their related business interests to affect representation of a client. If the propriety of a Member’s own conduct in a transaction is in question, it may be difficult or impossible for the Member to offer detached advice. Members shall advise all appropriate parties of potential conflicts. Members must immediately disclose their interest when referring a client to another firm or enterprise for services. Members shall refuse any gift, favor or hospitality that would influence or appear to influence their actions. 6. Members may use public communications, publish, broadcast, or use a form of advertising or solicitation which is presented in a professional and dignified manner conforming to Circular 230. 7. Members shall take positions favorable to their clients when there is substantial, reasonable basis in law and in fact for such a position. Members have the absolute duty to explain the probable effects of various alternatives to their client who must make the final decision as to the position to be taken when the applicable law is unsettled or the application of law to the facts in a given situation, is uncertain. 8. Members shall not knowingly, directly or indirectly, employ, form an association or partnership with, be employed by, accept assistance of, or share fees with, a person, associate, correspondent or subagent, who has been disbarred, suspended, or conducts his practice in a manner prohibited by Circular 230. 11. Members shall not solicit clients by advertising or other forms of solicitation in a manner that is false, misleading or deceptive. Members shall not solicit clients in a manner prohibited by Circular 230. It is the Member’s right to give service and advice to those asking for such service and advice. 12. Members shall undertake only those tax matters which the Member or the Member’s firm can reasonably expect to complete with professional competence. Members shall exercise due professional care in the completion of any engagement. Members shall obtain sufficient relevant data to afford a reasonable basis for conclusions or recommendations in relation to the task. 13. Members shall be considerate and courteous in dealing with representatives of governmental agencies. In practice, the Member is under a duty to provide all information required to be provided by statute or regulations, and formally requested by an authorized government agency. The defense of the client must be exercised within the bounds of the law and without resorting to deception. 14. Members shall not intimate that they are able to obtain special consideration from governmental agencies or their representatives. 15. Members shall advise a client promptly if they suspect the client may not have complied with the revenue laws or has made an error in, or omission from a return, document, affidavit, or paper which the client is required by law to execute concerning any matter. 16. Members shall not knowingly misrepresent or omit material facts in preparation of tax returns. Should a client insist, the Member should withdraw and refuse to prepare the return. the client fails substantially to fulfill an obligation to the Member regarding the Member’s services and has been given reasonable warning that the Member will withdraw unless the obligation is fulfilled. other good cause for withdrawal exists. Upon termination of representation, a Member shall take reasonable steps to protect the client’s interests, providing reasonable notice, allowing time for employment of another practitioner, surrendering papers and property to which the client is entitled, and refunding advance fees that have not been earned. The Member must retain papers relating to the client to the extent required by law. 18. Members shall furnish to clients or former clients, upon request and reasonable notice, any accounting or other records belonging to, or obtained from, or on behalf of, the client which the Member removed from the client’s premises or received for the client’s account. 19. Tax preparation services shall not be offered or rendered under an arrangement whereby the fee is contingent upon the findings or results of such services. However, a Member’s fees may vary depending on the complexity and duration of the service rendered. Fees are not regarded as being contingent if fixed by courts or other public authorities, or, in tax matters, if determined based on the results of judicial proceedings or findings of governmental agencies. 1. An Enrolled Agent should, in personal and public life, strive to enhance the status of the profession and promote its qualifications to serve the public. 2. An Enrolled Agent should demonstrate integrity and objectiveness. 3. An Enrolled Agent should continuously strive to improve upon his competence to practice. 4. An Enrolled Agent should maintain confidential relationships. 5. An Enrolled Agent should support all efforts to advance the reputation and welfare of the profession. 6. An Enrolled Agent should maintain the highest level of professional integrity in relationships with other Enrolled Agents, associated professionals and government officials.